Tesla is slashing prices on its solar systems 10–20% in recognition of the progress it has made streamlining its solar sales process by integrating Tesla Energy products into its existing high-traffic storefronts. “As a result of the vertical integration of our solar products into Tesla’s retail stores and the increased efficiencies we’ve realized over the past year by closing more expensive sales channels like door-to-door sales, we are now able to reduce prices for our solar power systems,” a Tesla Spokesperson said. The push to streamline the sales process for its solar and energy products is being made in direct support of the company’s fundamental mission to accelerate the world’s transition to sustainable energy. Creating best-in-class products and services at prices that not only compete, but undercut, the fossil fuel-fired establishment make it that much easier for customers to choose clean solar energy for their home. There is no need to sacrifice quality of life to make use of solar energy. The new pricing for Tesla’s solar products will see the cost of larger solar systems drop more than 20%, with the average customer realizing a purchase price decrease in the 10–15% range. This translates to a savings of $3,000 to $5,000 per customer, on average. The pricing improvements make Tesla’s already competitive systems some of the most affordable options for customers looking to go solar and make the prospect of adding some of Tesla’s other energy storage products to the purchase that much more accessible. The primary driver behind the price reduction is Tesla’s optimization of the sales process. Customer acquisition in the solar industry can be one of the top “soft costs” in the equation, particularly in the United States, amounting to thousands of dollar per customer in many cases. Tesla has integrated the sale of all of its energy products, including solar, into its existing retail stores, allowing the company to generate incremental revenue without adding staffing or additional real estate expenses. Customer gazing into a Tesla storefront after hours in Edinburgh, Scotland. In parallel to its improvements cutting costs buried in the sales process, Tesla is pushing to shrink the number of days it takes to get a system installed after the contract is signed. This is being driven through company-wide simplification efforts that have been resulting in streamlined contracts, reducing the wait times for customer service calls, and quicker permitting. Yes, obtaining a permit from the local governing authority is still about as exciting as watching cement dry, or even as painful as getting a bikini wax, but Tesla says it is doing what it can internally to make the process move as efficiently as possible. 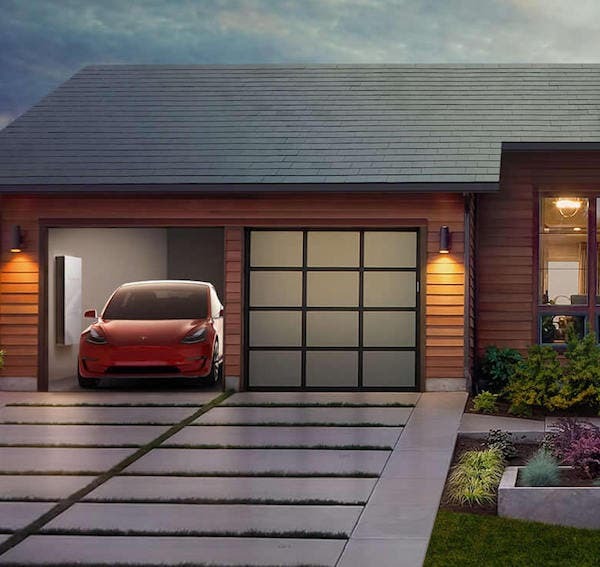 In typical Tesla fashion, the company is working to streamline the pricing of the physical solar system by bringing the manufacturing of all of its solar offerings in house. Vertical integration has proven to be one of Tesla’s core strengths in the automotive industry, and it has now taken the same path for its solar business. Panasonic, a key partner in the battery realm of the business, has also partnered with Tesla at its less celebrated Gigafactory 2 in upstate New York, which came into the family through its acquisition of SolarCity. Even before it was officially part of the Tesla family, the factory had been called the Solar Gigafactory due to its massive footprint. It’s clear that Tesla is finally able to breathe a little bit after stabilizing its Model 3 production woes and is now looking to tune up its energy business. Building its own solar panels and components cuts out the middle man and gives Tesla a competitive advantage versus competing installers like Sunrun, Vivint, and highly competitive smaller local installers. These installers have to purchase all of the equipment they install from other vendors, adding more cost to the contract price for the customer without adding any additional value. *For the record, I have not had a bikini wax and have no idea why anyone would willingly inflict such pain on themselves, let alone pay for it.